hey whats, in a name, said the Bard. Rose is sweet in any language. But when it comes to medicine, the plethora of tongue twisters like keratoconus, form fruste keratoconus, pellucidal marginal degeneration or intacs, intacts, fleirs reing reminds me of K$sha’s song- Balh, blah, blah. Cmon why we cant KISS- keep it simple stupid. Keratoconus is low rigidity flabby cornea. Intacs are plastic segments very much like a miracle bra or suspender. It moves the floppy cornea up. was that difficult to understand. or do you prefer the geek gibberish which may sound like greek or latin or blah blah blah. Sorry,this is not our area of expertise. Best of Luck in your search.We are in Los Angeles and specialize in Keratoconus and its treatment. We use Intacs and crosslinkage with riboflavin to improve the vision of people in Los Angeles. The causes of this condition are still unknown despite our familiarity with this disease. There have been many studies and there have been many theories. One proposal suggests that orange county keratoconus depends on a defect in the development and genetic (about 7% of patients have relatives with keratoconus). This suggests that the consequence of an abnormality in growth, essentially a birth defect. Another is that Keratoconus is a degenerative condition. A third postulated that keratoconus is secondary to other diseases. A less accepted theory suggests it may be of endocrine origin. The actual incidence of orange county keratoconus is not known. It is one of the most common afflictions of the eye but it is by no means a rare disease. Is estimated to occur once in every two thousand people. Usually the disease occurs in young people at puberty. It is found everywhere in the world without follow any geographical pattern, cultural or social acquaintance. Several sources suggest that keratoconus probably arises from a number of different factors: genetic, environmental or cell phone, no one can form the trigger that will initiate the disease. There are also doctors who associate the scratching keratoconus eyes. Often the patient has allergic rhinitis associated with keratoconus, which causes the eyes itch often. This can cause thinning of the cornea due to mechanical removal of epithelial cells. The visual distortion experienced by the patients come from two sources, one being the irregular deformation of the surface of the cornea, and other scars formed at points of high curvature exposed. These factors act together to form regions on the cornea which projects an image into different regions of the retina and cause the symptoms of monocular diplopia or monocular poliplopia. The effect can worsen in low light because the pupil tends to dilate in order to receive more light, and thus further exposing the irregularities of the cornea. Scars seem to be an aspect of the degradation of the cornea, however, a large multi-center study conducted (Clek STUDY – Collaborative Longitudinal Evaluation of Keratoconus Study) suggests that the abrasion caused by contact lenses may increase the tendency of this finding on one factor above two, or more than double the chance of occurrence. Recent studies have shown that orange county keratoconus corneas show signs of increased activity of proteases, a class of enzymes that break part of the collagen fibers in the corneal stroma, with a simultaneous significant reduction of the action of protease inhibitors. Other studies have suggested that the reduction of activity by the enzyme aldehyde dehydrogenase may be responsible for the creation of free radicals and oxidant species in the cornea. It is quite likely that whatever the pathogenic process, the damage caused by activities in the cornea resulting in reduction of its ultrasound pachymetry and weakening their resistance biomechanics. A genetic predisposition for keratoconus has been observed, with the disease manifesting itself in certain families, and reported incidences of concordance in identical twins. The frequency of occurrence in close relatives is not clearly defined, although it is known that the incidence is considerably higher than in the general population, and studies have obtained estimates ranging between 6% and 19%. The gene responsible for keratoconus has not been identified: two large studies involving isolated communities homogenéticas contrary has indicated as causes of genetic disease mapped to chromosomes 16q and 20q. However, most genetic studies agree on a model autosome dominant hereditary. Keratoconus is also diagnosed more often in people with Down syndrome, although the reasons for this link have not yet been determined. Keratoconus has been associated with atopic diseases. including asthma, allergies and eczema, and it is not uncommon for many or some of these diseases affect a person. Studies suggest that rubbing the eyes vigorously may contribute to the progression of keratoconus, and patients should be discouraged from this practice. People with early keratoconus in los angeles typically report a small blur his vision and seek a professional in search of contact lenses for driving or reading. In early stages, the symptoms of keratoconus may be the same as any other refractive defect the eye. As the disease progresses, vision deteriorates, sometimes rapidly. Visual acuity becomes impaired at all distances and night vision is often quite poor. Some people have vision in one eye that is markedly worse than in the other eye. Some develop photophobia (sensitivity to bright light), eye strain by forcing the eyes while reading or itching in the eye. However, there is usually little or no sensation of pain. The classic symptom of keratoconus in Los Angeles is the perception of multiple ghost images, known as monocular polyopia. This effect is most clearly observed in a field of view with high contrast, as a point of light in a dark environment. Instead of seeing only one point, a person with Orange County keratoconus sees many images of that point, spread out in very irregular pattern. This pattern typically does not change every day, but usually during the time it takes new forms. In some cases the patient may present with monocular diplopia in this case is the presence of double image, not multiple. Some patients also reported traces of light reflections and distortion (Lens Flare) around light sources. Some have even reported moving images against each other following their heartbeats. The first sign of Los Angles keratoconus is blurred vision at first can be corrected with eyeglasses. Since it is a progressive disease, will require frequent changes in the formula of glasses. The thinning of the cornea progresses slowly over 5-10 years and then tends to stop. Occasionally it is rapidly progressive and advanced stages the patient may experience sudden blurred vision in one eye. This is called Acute Hydrops “and is due to the sudden entry of fluid into the cornea thinned. This hydrops improves with time, taking weeks or months to disappear. In advanced cases superficial scarring at the apex of the cornea resulting in further decrease in vision. Keratoconus or conical cornea is a disorder of the human eye which rarely causes blindness but can significantly interfere with vision. It is a condition in which the normally round cornea becomes distorted and develops a cone-shaped prominence. Since the cornea is the main lens of the eye, vision decreased significantly at the deforming in this way. The progression of keratoconus is usually slow and can stop at any stage: from mild to severe. If the keratoconus progresses, the cornea bulges and thins becoming irregular and sometimes forming scars. Keratoconus is a non-inflammatory degenerative disease of the eye in which structural changes in the cornea to become thinner and change to a more conical shape (ectasia) that its normal gradual curve. Keratoconus can cause substantial distortion of vision, with multiple images, streaking and sensitivity to light all often reported by patients. Keratoconus is the most common corneal dystrophy, affecting one person in a thousand, it seems to occur in populations worldwide, although some ethnic groups have a higher prevalence than others. It is usually diagnosed in young patients and presents its most severe in the second and third decade of life. Keratoconus can be treated in Los Angeles . Los Angeles Lasik and corneal surgeon Dr. Khanna says definitive treatment is achieved only by surgical removal. The pterygia may be removed in a procedure room at the doctor’s office or in an operating room setting. It is up to your eye doctor to determine the best procedure for you. The treatment requires some local anesthetic in the eye and is best done at the time of the pterygium excision to deaden feeling in your eye’s surface. Conjunctival auto-grafting is a surgical technique that is effective and safe procedure for pterygium removal. 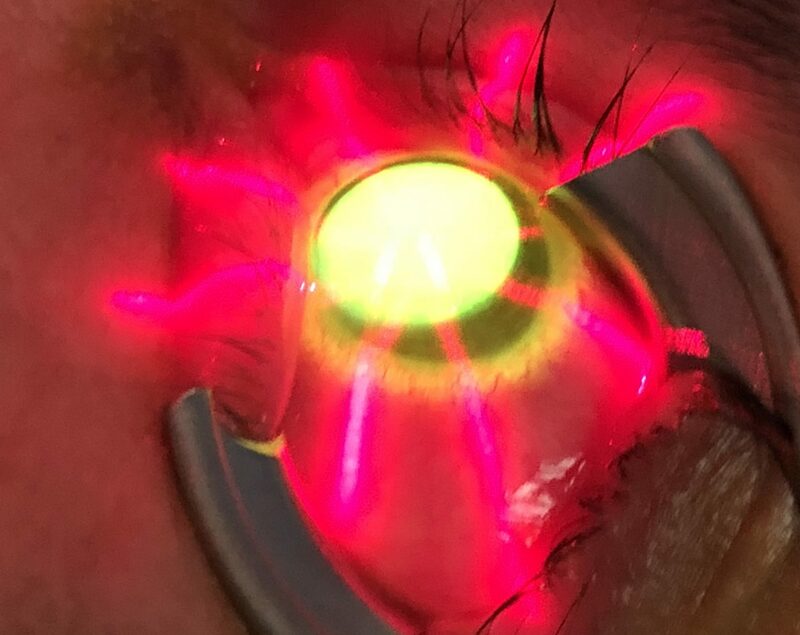 When the pterygium is removed the tissue that covers the sclera known as the conjunctiva is also extracted, auto-grafting replaces the bare sclera with tissue that is surgically removed from the inside of the patients’ upper eyelid. That “self-tissue” is then transplanted to the bare sclera and is fixated using sutures, tissue adhesive, or glue adhesive. After treatment you should be able to return to work. Drops or gel are used to numb the eye. The pterygium is then removed. A graft, which is a thin clear membrane like cellophane paper is then glued on. Most patients can go back to work or normal activities the next day. Is There a Possibility of Reoccurrence? In fact, the recurrence rate is between 3 percent and 40 percent. To prevent re-growth after the pterygium is surgically removed, your eye surgeon may suture or glue a piece of surface eye tissue onto the affected area. This method, called auto-grafting, is very safe and has a low recurrence rate. Even though the use of auto-grafts has resulted in better success rates, it is technically difficult, time consuming. You will be happy to know that Los Angeles LASIK expert Dr. Khanna has performed thousands of such surgeries. Simple excision without auto-grafting carries a high recurrence rate ranging from 24% to 89%. The addition of mitomycin C (MMC) has been reported to be effective in preventing recurrence. However, postoperative application MMC, especially on a bare sclera, may result in devastating complications such as scleral necrosis and infections. Decreased Vision and astigmatism: As the pterygium grows it pushes the corneal tissue causing flattening in the horizontal axis. This causes vision problems. Blindness: if the pterygium crosses the dark part of your eye it can interfere with the light reaching the eye. This can lead to blindness. Restriction of eye movement: pterygium can be considered like an elastic string attached to the eye. If this becomes fibrotic the elasticity is lost the pterygium then acts like a restrictive chain interfering with eye movements. Cancer: Pterygium may harbor cancer cells some times. This is more common if it is a younger patient, only one eye has a pterygium (asymmetric), or the pterygium starts growing aggressively. It is recommended to do a biopsy examination on these removed specimens. Can You Have LASIK ? Dr. Khanna recommends to first taking care of Pterygium. Removal of the pterygium releases the tension on the cornea and allows it to return back to its normal shape. If LASIK is done first than there is a chance that the pterygium might grow over the flap causing problems, including dissolution of the flap. Also surgical removal becomes difficult, and when the pterygium is removed the number may recur. Then either LASIK, SuperLASIK or presbyopic implants may be implanted. Vision Insurances like VSP or MES do not cover such surgeries. We do accept cash or credit cards if you do not have insurance. But there is Good news! Yes if you have medical insurance they will cover the cost of the surgery. Medicare, blue cross, BlueShield etc, will cover medically indicated Pterygium surgery. A person with pterygium should be seen by an ophthalmologist annually, so that the advancement of the pterygium can be recognized, especially before the pupillary zone becomes involved. Call for an appointment with your ophthalmologist if you have had a pterygium in the past and symptoms recur. Welcome to the fight against the debilitating disease of keratoconus. Armed with Intacs and Crosslinking technology, Keratoconus expert Rajesh Khanna, MD is rat the forefront of the battle. FDA approved Intacs help improve the shape of the cornea. Crosslinking C3 R, help make the cornea stronger.